The table below provides the tuition and rates for the Summer 2016 Residential Program for a 2-week Session. If you are an overseas organization interested in our Summer Residential Program, we do offer discounts for groups larger than 5+ students. Please email us at summer@nuvustudio.org with your inquiries. A deposit of $200 per Session must accompany each registration, and can be paid online through NuVu’s website. Deposits are credited to the student’s final balance. Deposits are refundable only until March 1st, 2016, after which they become non-refundable. Credit cards are accepted for online deposits only. Information on NuVu’s refund policy is below. If you have any questions, please contact us at summer@nuvustudio.org. All participants are required to have coverage from a U.S. based accident and health insurance provider. Short term health insurance is offered by many U.S. companies such as USI Affinity Travel Services. Short term health insurance is necessary to pay for any medical attention you might need. Please remember that, while “Travel Insurance” may assist a student with travel costs in the event of an emergency, many policies do not cover medical bills. International participants and others without this coverage will be billed for a short term accident/health policy. Credit cards are accepted for online deposits only, not for final payment. Final payments must be made by check, domestic wire, or international cable. Checks must be drawn on U.S. Banks in U.S. funds. We will not accept checks drawn on a foreign bank. Please contact our Admission Office (summer@nuvustudio.org.) for information about making a payment via wire transfer. Final payments must be received in full by May 20, 2016 for all students. Students applying after the final balance due date of May 20, 2016 must pay the entire bill immediately after acceptance via bank transfer. In the event that space is not available in the program, families will be notified in writing that the student has been placed on a waitlist and NuVu will hold the deposit. If space does not become available for the student, or if the family wishes to be removed from the waitlist, NuVu will return the deposit in full. Any returned checks will result in a charge of $20. Families interested in setting up a payment plan for their final balance should contact Karen Sutton, Operations Manager for details at 617-945-7716. Payment plans must be set up by March 15, 2016. Please be aware that final payment under any payment plan must be received by May 20, 2016. We provide limited financial aid for our Summer Day Program on a need basis. If you are interested in receiving more information about financial aid for our Summer Day Program, please contact us at summer@nuvustudio.org with “Summer Day Program Financial Aid” in the main subject line. Deposits are refundable until March 1, 2016. After that date, deposits are non-refundable. Between May 20, 2016 and the program's start date, a full or partial refund of tuition (minus the deposit) will be considered only if the student can be replaced. 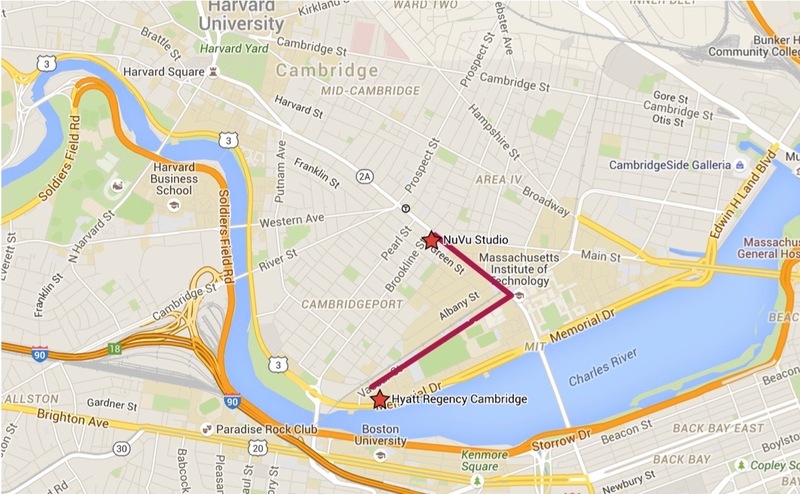 Participants in NuVu’s Summer Residential Program will live in the 4-star and conveniently located Hyatt Regency Hotel in Cambridge located near MIT’s campus along the scenic Charles River. A complimentary shuttle service is available daily and will take students within a 5-minute walk from NuVu. Students will share a double occupancy room with other high school students enrolled in the Summer Residential Program. Students will have the support of a full administrative and residential staff with Residential Assistants (RAs) assigned to groups of approximately 6 to 10 students. Breakfast, lunch and dinner meals, included in the Day + Residential Program fee, will be served buffet-style or will take place in the city as part of organized trips and dinner excursions. If there are any specific dietary restrictions for any student taking part in the program, please include these details on the Health Form provided to registered students. Below are outlines of typical weekday and weekend schedules during the Summer Residential Program. NuVu’s pedagogy is informed by the architectural design Studio where a coach guides students in hands-on problem-solving to solve complex, comprehensive problems. The Studio model uses exercises to build skills and integrates students’ knowledge in a final project. Within each multidisciplinary Studio, students explore problems rigorously by focusing on one project for two weeks. A Studio Coach mentors students to develop their project through an iterative process over the course of the Studio. Students confront the small and large contexts within problems as they are exposed to complex, ‘messy’ situations. The NuVu Team continuously evaluates students through desk crits and final reviews. To learn more about NuVu’s Studio model, please visit our About Page at https://cambridge.nuvustudio.com/studios/about#tab-studio-model. Note: Students will be at NuVu Studio every weekday no later than 8:55am. Each weekend, students will go on various trips throughout the Cambridge-Boston area. Trip departure and return times vary, but generally leave after breakfast and return by evening time. Note: Students will also be back in the hotel by 9:30pm every evening unless a structured residential activity has been organized and is supervised by staff. *These are examples of activities that may be available to Summer 2016 Residential Students and are subject to change based on availability and timing. Below are some frequently asked questions regarding our Residential Program. If you have any additional questions, please email us at summer@nuvustudio.org. 1. 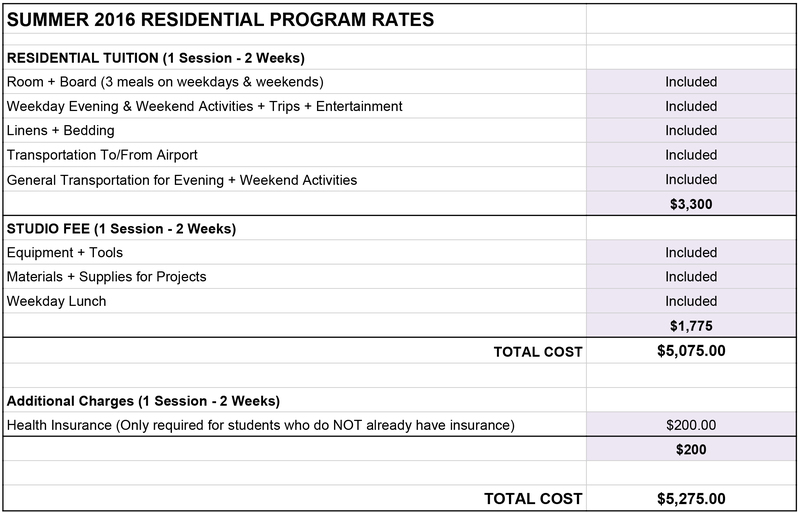 What is the cost of NuVu’s Summer 2016 Residential Program? Are there other fees? The Summer 2016 Residential Program fee is $5,275 for one 2-week Session. The Residential Program fee includes the Summer 2016 Day program tuition, lodging in the 4-star and conveniently located Hyatt Regency Hotel, full board (3 meals a day), all evening trips, entertainment, activities, linens and bedding, transportation to/from airport, and general transportation for organized evening and weekend activities. Airfare, meals purchased outside the program, and personal shopping are not included in this cost. Families have the option to pay an additional health insurance fee if they do NOT have their own health insurance plan. We begin accepting registrants on January 8, 2016. Students can enroll directly online and we will follow up with an application. Once completed, students can send the application with all supporting documentation to summer@nuvustudio.org and NuVu will confirm their enrollment and along details for the final payment. 3. Who is eligible to apply? Current 8th, 9th, 10th, 11th grade students and postgraduate students. 4. If I require assistance with the application, who should I contact? You can email summer@nuvustudio.org or you can call 617-945-7716, 9:00 am to 5:00 pm EST. There is very limited financial aid available for the Summer 2016 Day Program. You can email summer@nuvustudio.org for more information. 6. When can I expect to hear about my admission status? Admissions decisions will be made on a “rolling” basis. Our team will review the application and respond to your request with the admission decision within three (2) weeks of the receipt of submitting a completed application. 7. How many studios can I take? The Summer Residential Program is limited to one 2-week Session (1 Studio); however, students are welcome to enroll in the NuVu Summer 2016 Day Program studios on a first-come, first-serve basis for the other Sessions (Session 1 and 2). 8. Where will the Summer 2016 Program be taking place? NuVu’s Summer 2016 Program will be taking place at our home studio located at 450 Massachusetts Avenue, Cambridge, MA 02139. Students will be staying at the 4-star Hyatt Regency, Cambridge, located near MIT’s campus along the scenic Charles River. A complimentary shuttle service is available daily and will take students to within walking distance to NuVu. Each students will share a double occupancy room with another high school student enrolled in the Summer Residential Program, and will be matched appropriately. Students will have the support of a full administrative and residential staff with Residential Assistants (RAs) assigned to groups of approximately 6 to 10 students. 10. Will attending NuVu’s Summer 2016 Residential Program increase my chances of being admitted to MIT and other universities? Participating in NuVu and mentioning that you did so on your college application is likely to be viewed by admissions counselors as one indicator of academic seriousness and hands-on learning. However, it is just one indicator among many factors that are assessed in a comprehensive application review and does not guarantee an offer of admission. 11. What type of universities and colleges do NuVu Alumni attend? Our NuVu Alumni attend a wide range of universities and colleges in the US and abroad. Below is a partial list of some of the schools that our Alumni are currently attending.